Chopping tomato is real mess sometimes. I just want to know that what is the best chop tomatoes without any mess? One trick I did was to deep freeze tomatoes before cutting them and then used to chop them. But if we don't have time to deep freeze i.e 20 mins then what are other options? You need a sharper knife. With a dull knife, you'll have trouble getting through the skin, and end up tearing and smashing, releasing a lot of juice. With a sharp knife, you'll get through the skin cleanly and leave the tomatoes much more intact. Serrated knives are another common option: they get through the skin very easily. A dull serrated knife will tear the flesh up a lot, though, so you still do need a reasonably sharp blade, and while a cheap bread knife or steak knife might be better than nothing, it's not ideal. 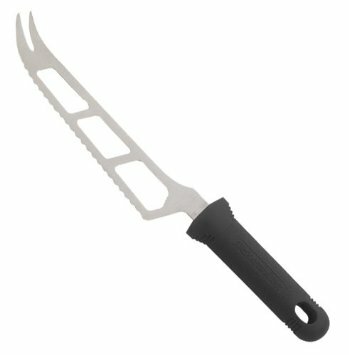 The best ones are probably the ones actually marketed as tomato knives: they're sharp, not too thick, and have a serration pattern that's meant for this. If you're forced to make do with an inadequate knife, you can break the skin with the tip, then extend that with the blade and slice from there. If the knife is so dull that it still makes a mess, you might be out of luck. This is pretty time-consuming, though, so I wouldn't suggest it as an everyday method for a lot of slices. Freezing, as you suggested, doesn't sound like a great idea. If you freeze tomatoes thoroughly enough to make them firmer and easier to chop, then you'll have formed a lot of ice, and once they thaw, they'll tend to disintegrate and release all that juice. It won't affect the flavor, but it's kind of pointless, since if you're willing to mess up the texture that much, you might as well just hack it up whatever messy way you like. Although a sharp or serrated knife are the best solution, there's also a trick that you can use when you're working with less than ideal knives (ie, in someone else's kitchen). Use the tip of the knife to stab the tomato at the spacing that you'll be cutting it. If dicing, place a couple of slices on the board, and then slice down through them. When dicing the ends, place the slice skin-side down before cutting. Effectively, you're breaking the skin of the tomato like a serrated knife would to help you get it started. For the other slices, you're not cutting from the skin side, so you won't have the problem with the knife slipping. My favored way is a very sharp cooks knife. Others have said serrated knifes. I also do that if my cooks knife needs sharpening (sometimes I neglect it). Note: there are general use serrated knives, often used to slice bread. 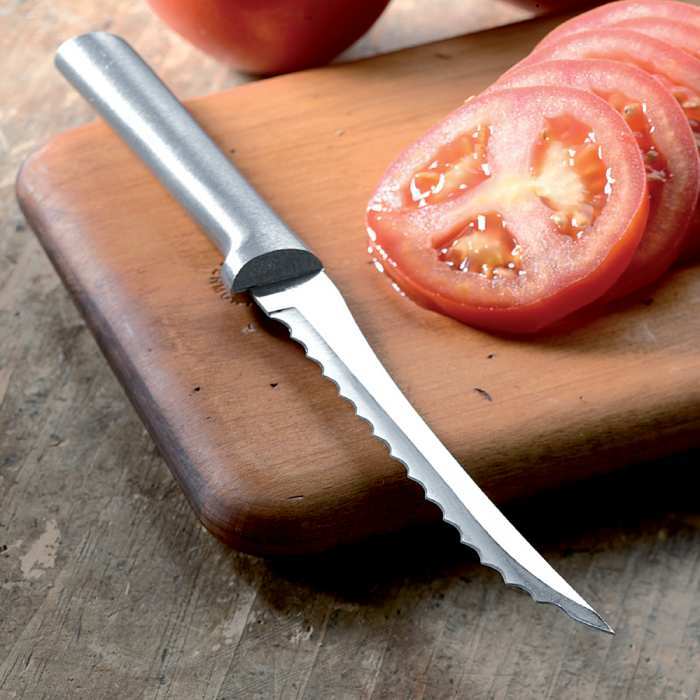 Also on the market are serrated knives specifically made for tomatoes. I think the serrations purpose-built for tomatoes are gentler on the flesh and meat of the tomato. I've seen them at decent prices 6 to 8 U.S. dollars. Use a serrated knife with a long blade. Like a bread knife! When cutting, try not to apply too much pressure (i.e. press down into the berry, or use a vigorous sawing motion). That squeezes out tomato juice. Instead, let the weight of the blade do most of the work. This is why I recommend a long blade. A nice, slow draw from the heel of the knife to its tip across the flesh of the berry should get you most--if not all--of the way through the fruit. If you have a particularly tough-skinned tomato, try using the tip of the blade to make an initial slit, then finish the cut with the serration. Once the interior of the tomato is exposed it should be smooth going. While using a sharp serrated knife, place the whole tomatoe upside down on the cutting block. Cut down through the tomatoe without cutting through (I.e. Let the top of the tomato hold together). Cut as thick or thin as you want. If you want slices, then once you have cut then all then turn the tomato on its side and hold the tomato together with the top toward your knife and slice through and you'll have a neat stack of slices. If you want diced or chopped, then leave the tomato upside down and turn it 90 degrees. Hold the slices together. Slice down to but not through the top again, as thick or thin as you like. Now the fun part. Turn the tomato over onto its side so that the stem points away from the cutting board. Hold the tomatoe around so the pieces don't slide all over, and slice down through the tomatoe starting at the bottom of the tomato for the first slice. You should be gifted with a perfectly chopped or diced tomato, uniform pieces and a top of the tomato being all that's left. Works perfectly for onions too, with the exception of cutting the onion in half through the base first. Not the answer you're looking for? Browse other questions tagged tomatoes cutting or ask your own question.